The Sims has always been a weird, wacky, and wonderful way to explore characters experience outrageous lifestyles. 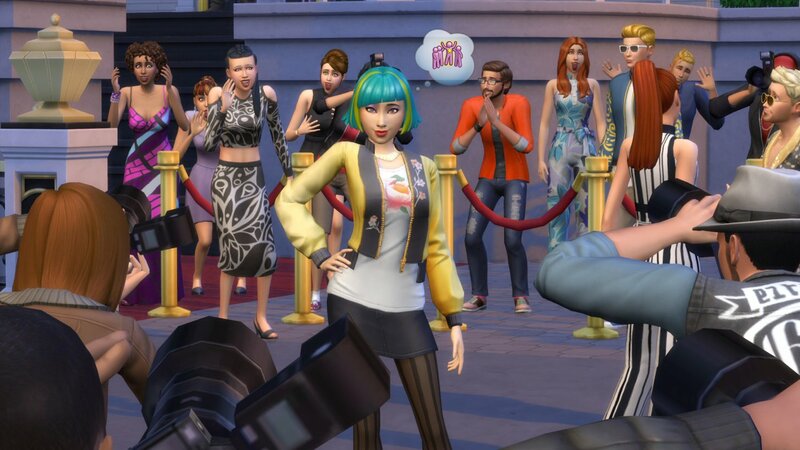 It’s as much a storytelling tool as it is a simulation game, and the Get Famous expansion for the Sims 4 is about to take it all to a whole new level. Bringing new careers, outfits, interactions, locations, and even an entirely new point of view, there’s a lot for Sims fans to get hyped about. I started my exploration of Get Famous at the studio. A green screen stretched behind an wild western set as my sim, outlined by the glowing aura of stardom, headed to hair and makeup to get into character. The new careers build upon the foundations laid in the Get to Work expansion, and success in the acting career in Get Famous requires more than luck. First, you need an agent. There are a number of agencies you can choose from, each with their own little quirks and flavors. The AI Agency tends to send you very robotic messages, with cute little asides like “[insert compliment here]” sprinkled into their text, while the Grandma Agency will send you cookies along with their notes. The next thing you’ll need is some actual talent. By calling up your agent, you can get a list of parts you can audition for, and booking a gig is more than just showing up and looking good. Some parts will require you to build up your musical skill or to have achieved a certain level of fitness. Once you’ve gotten a role, you’ll head to the studio and put on a performance. Early on, your acting career will mostly revolve around commercials, requiring you to sell products with a cheesy smile, but Bex, my Sim for this demo, had already grown beyond that part of her career. She was a movie star, and not just any movie star–a movie star in a sci-fi western; a film featuring a saloon, an old-school jail, and co-stars in full-body alien costumes. A set marker has been introduced to the game, a small X or pair of X’s you can place on the ground to make an action happen. I pointed Bex to her mark and, after taking a few moments to prepare herself and steady her nerves, she pulled out her guitar to try a risky musical performance. She finished her solo by spinning her guitar with a flourish, then headed over to perform a raygun fight with a costumed co-star. They both headed to their marks, and I took a moment to have her chat with the co-star, strengthening their friendship and increasing the likelihood that her risky performance would work out. It didn’t. The blaster hitched on Bex’s finger when she tried to twirl it, causing it to go off, nearly blasting a hole in the rubber mask of the other Sim. The two shared a laugh that felt like a genuine moment off a blooper reel, and then they moved on to the next scene. There are a lot of really fun things in the acting studio, from the green screens to the many set pieces, which could have been tragic, since you spend a relatively limited amount of time there. The good news is, all of these set pieces can be added to your house, meaning you can live in a movie set or finally give your space age, old west, or pirate Sim the home they deserve. Want to put your Sims in a post-apocalyptic setting? The new sets provide collapsing doorways and piles of wrecked, gutted cars to help make your role-playing dreams a reality. Drop in a few set markers and your characters can even settle disagreements by sword fighting… or laser sword fighting, if that’s more your speed. Either way, it’s way more exciting than rock-paper-scissors. There’s one more new object which is subtle yet incredibly exciting: blocking tape. Usually striped with yellow-and-black, Sims will not walk into the area marked by this tape. Even more exciting, not only does it come in different colors, it will still be effective even when obscured by items like rugs, meaning that you can now create no-entry zones and better control where your Sims walk. Having wrapped a hard day’s work, Bex chatted with her coworkers, kissed up to the director, (who was kind enough to give her a few tips on her career) and grabbed some of the on set food before going incognito, which consisted of her donning a ball cap and sunglasses, then headed home. Here I got to check out one of the new, pre-made homes, a massive mansion perched in the hills overlooking Starlight Boulevard, the Sims’ version of Hollywood. This mansion is massive, and features two of my favorite new items, a koi pond and the vault. The koi pond is exactly what the name suggests, but can be stocked with more than just koi. You’re a celebrity, so why not live dangerously and stock your pond with piranhas… or even sharks. Both are possible, as is swimming with said fish. Just as in real life, celebrities can rack up a lot of cash: enter the vault. This huge safe, located inside your house, can be filled with your Simoleas. If you store enough, they will form huge piles of cash which you can play in, nap in, and even woohoo in. Combine that with the new “make it rain” self-interaction, where you can toss out up to 1,000 Simoleas, and your Sim is truly ready to live the Hollywood life. Starlight Boulevard twinkles in the distance below you; spotlights sweep through the sky, and the city below feels genuinely alive. Plus, as someone who has lived in Hollywood for nearly a decade, Starlight Boulevard feels very familiar. It’s a beautiful new setting, and one that is arguably best viewed through Get Famous’ new two-story, glass-sided infinity pool. There’s so much inside of Get Famous that I’m having trouble touching upon everything from my one hour play session. I added my Sim’s star to the Starlight Walk of Fame, defaced the star of my rival, set up my own private party, (complete with a bouncer who would not let anyone below a certain star ranking into my party) and even had paparazzi and a tour bus show up to my house. And that’s just what happened with one Sim. Acting isn’t the only way to gain fame, you can also become an influencer. While Bex is out building her acting career, her husband stays at home, building an online DJ career. New computer items allow him to tease new tracks, interact with fans, and act as his own online publicist. A DJ booth allows him to edit, cut, and burn tracks, creating CDs which can be sent to radio stations. There’s even an adorable livestreaming drone which will follow him around, broadcasting his daily life to the Internet. How long until someone uses this adorable new item to build a career around livestreaming woohoo? Probably not long, though I didn’t ask if the game will block this kind of use. Influencers can even customize their career titles, so if you want to be a DJ spinning the best tunes from the 80’s and 90’s, you can earn your fame by doing just that. It’s an empty text field, so the only limits to your career titles will be your own imagination and wordsmithing skills. There’s one more incredibly fun feature included in Get Famous, the ability to switch to a first person view. Get ready to create some of the most entertaining reality or documentary style videos ever produced in Sims, because viewing the world through the eyes of your Sim is incredibly fun. Even custom animations, such as sword fighting, can be viewed from the first person. The launch of this feature fits perfectly with the option to play as a Youtube or Instagram-style social media superstar, and I can’t wait to see what fans do with it. The Sims 4 Get Famous expansion will be coming to PCs on November 16th. Check out the official site for more information, and to get an eyeful of the new, super cute two-colored hairstyles.